In July, the group will be reading and discussing The best of it: New and Selected Poems by Kay Ryan, United States Poet Laureate 2008 - 2010. Our poetry book club, led by Linda Leavell, meets the 2nd and 4th Wednesdays of each month at 5pm. Readings from an assigned anthology or collection are discussed, but come try out a meeting even if you didn't get the poetry read. They welcome new members and will get you on the discussion list for the next meeting. 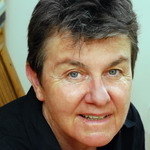 In July, the group will be reading and discussing The best of it: New and Selected Poems by Kay Ryan, United States Poet Laureate 2008 - 2010. Kay Ryan is currently considered a "single author." If one or more works are by a distinct, homonymous authors, go ahead and split the author. Kay Ryan is composed of 1 name.